Set includes: five figures, island with bastion, pirate ship with sail and anchor, treasure chests, map, palm tree, skeleton, parrot, and many other accessories (149 pieces). 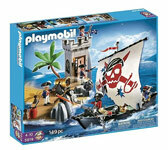 This is another great toy of the pirate series made by PLAYMOBIL, Germany's largest toy manufacturer. Your child will find swashbuckling adventure with this Pirate Bastion Set. SAFETY INFORMATION: Playmobil� toys are designed and produced by very well recognized German company with traditionally strict quality and safety controls (conforming by law and exceeding very strict European Union Safety Standards and Requirements). Manufacturing and design standards (including chemical content) exceed safety requirements set by U.S. and Canada Consumer Products Safety Commission and Standards.